A fast and easy way to manage and display your family tree. 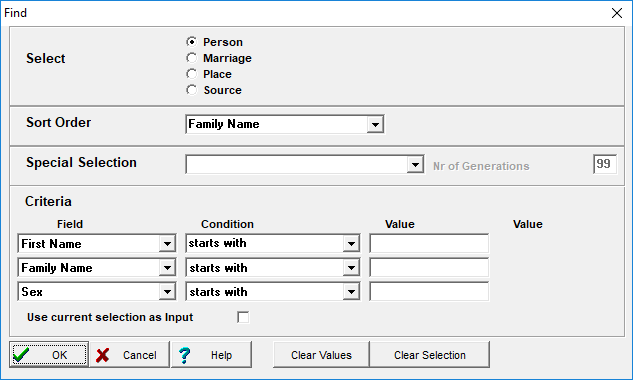 Fzip allows you to navigate easily around your family tree using a combined Descendant and Ancestor view. 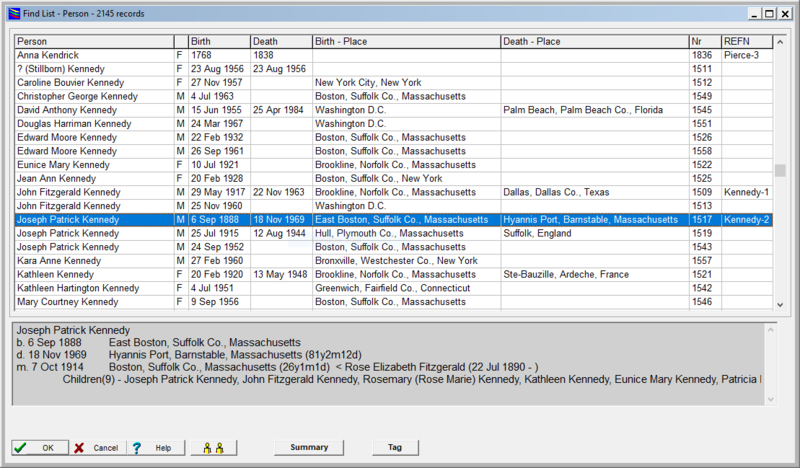 Fzip Family Tree is a highly featured, fast and easy to use genealogy package. The software allows a person to view, search, maintain genealogy details and report on family trees. It has EXTREMELY high speed GEDCOM import and export facilities making it suitable as a GEDCOM browser. It has very high speed search capabilities. The main screen show 5 generations of people in an hourglass format and provides simple navigation around a family tree. A simple search facility (Easy Find) is available to quickly and easily find people. In addition a powerful and fast search (Find) and sort facility can search by any field for People, Marriages, Places and Sources and includes a special selection to select Roots, Unrelated, Ancestors, Ancestor Roots, Descendants. Entry and modification of data is simple and quick using full screen data entry. In addition an Alphabetic Index report can be produced of people reported in the Descendant Tree, Box, Story and Family Group and Ancestor Tree and Story. The Select reports have choices for sorting the data. Reports can be directed to the screen, printer or file. Many reports can be output as RTF format files. All Reports can be produced in PDF using Microsft PDF as printer. Picture support is available. It has a web page generation function. There is a limit of 3,276,000 people per file. One person can have up to 600 children. A bookmark facility is available with up to 20 bookmarks being available for use. These are stored with a genealogy file. New Genealogy files are easily created and accessed and use little disk space. The number of genealogy files supported is limited only by available disk space. More than one copy of the program can be running at a time on a machine so that multiple files may be open at one time. When a genealogy file is saved a backup of the previous version is stored. The main differences between this software and others is the speed of displaying, searching, importing and exporting data and the small size of its data files. Find List Screen displays result of a Find of Person, Relationship/Marriage, Place or Source. The following is for a Find of Person. Find Screen accepts entry of a selection to display on the FindList. It can be used to find - Person, Relationship/Marriage, Place or Source. Fzip Family Tree is free to use. The program does not need to be registered to use. This version of Fzip runs on Windows XP to Windows 10. Because this is a new release only a full English version is currently available. As updates are made to the translations these will be updated and included in the installation. Thanks to Grzegorz Kwiatkowski for the Polish translation. Thanks to Manfred Hirtler for the German translation. Original Italian translation by Carmel Sacco. Thanks to Ladislav Filo for the Slovak translation. Thanks to Vlastimil Jirout for the Czech translation. Thanks to Guðrún Jóhannsdóttir for the Icelandic translation. You can select the language to use as you require. If you wish to customise the program in another language please contact the author. Not all language translations will be up to date. Fzip V2.0.4 - click on the EXE name setupFzip20.exe. Size is 763kb. Date 19 April 2019. When you install this Windows will identify it as not a trusted publisher and also give a false positive of a potential virus. It is not a virus. If you are concerned try another virus checker to confirm. Podrecznik uzytkownika - User Guide in Polish for previous version (1.7) of program - click on the zip name uguidepol.zip. Size is 135kb. Date 7 Sep 2003. The file is a zip file in Microsoft Word 97 format. Thanks to Wojciech Bartmiñski for the translation. To assist language translation - Fzip Language Translation Tool setupFzipLang.exe size is 459kb Date 19 April 2019. Functional support for Sources is limited. Program supports limited set of fields. While not necessarily suitable for complete sourced documented information, it is very good as a browser of GEDCOM files.